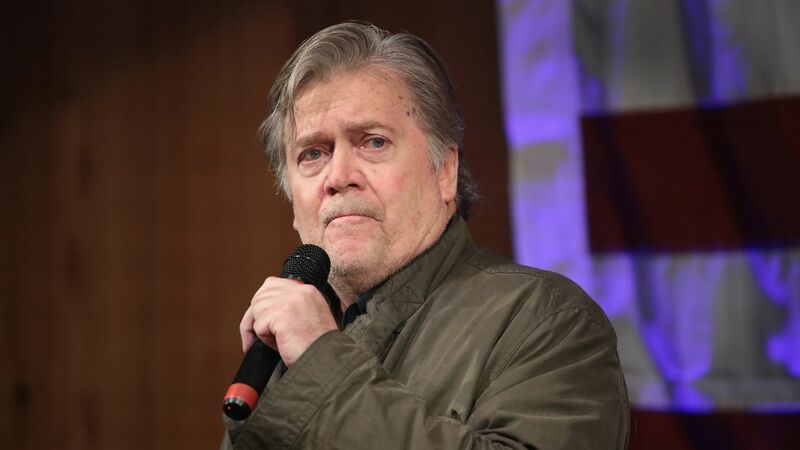 Steve Bannon made one conspicuous slip up in his closed-door hearing on Tuesday with the House Intelligence Committee, according to four sources with direct knowledge of the confidential proceedings. Bannon admitted that he'd had conversations with Reince Priebus, Sean Spicer and legal spokesman Mark Corallo about Don Junior's infamous meeting with the Russians in Trump Tower in June 2016. Why it matters: The meeting — and the subsequent drafting of a misleading statement on Air Force One — has become one of the most important focal points of the Russia investigations, both on Capitol Hill and within Robert Mueller's team, because it provides the closest thing that exists to evidence that the Trump campaign was willing to entertain collusion with Russians. Bannon immediately realized he'd slipped up and disclosed conversations he wasn't supposed to discuss, because they happened while he was chief strategist in the White House. Throughout the rest of the session, committee members — in particular Republican Trey Gowdy and Democrat Adam Schiff — hammered Bannon over the fact that he'd mentioned those conversations but refused to discuss anything else about his time in the White House. Bannon's lawyer, Bill Burck, told the committee in his opening remarks that Bannon wouldn't answer any questions that relate to his time inside the White House or during the presidential transition. The committee caught him in the slip-up inside the first 90 minutes. After the hearing started, the New York Times dropped its story about the grand jury subpoena of Bannon. Nobody in the room had their phones — it's the protocol in closed-door intelligence hearings — but an official walked in to inform the committee and Bannon's team of the story. Bannon attacked the Republicans running these congressional committees for choosing to investigate the Trump campaign and Russia. He said it was part of an "establishment" plan to try to "nullify" the election result. Gowdy challenged him on that, asking Bannon who is this establishment you refer to who is trying to nullify Trump's victory? Bannon answered: Paul Ryan and Mitch McConnell. Gowdy countered that Bannon couldn't have it both ways. Was he also referring to Trump confidant Kevin McCarthy — the leader of the Republican House conference — who is surely part of the same Ryan-McConnell "establishment?" Another pointed question to Bannon: When he told author Michael Wolff there was a "zero" percent chance that Don Junior didn't bring the Russians up to see his father after their meeting, how did he know that happened? I'm told Bannon all but conceded he was purely speculating. Throughout the hearing, Bannon kept telling the committee members: "I really want to answer this question," and "I really wish I could answer these questions." That became a sore point with members. They kept asking him why he felt liberated to abandon executive privilege and leak prolifically about the White House to journalists and author Wolff, but wouldn't talk to Congress.